Terex Port Solutions (TPS) has installed a second Terex® Gottwald portal harbour crane in the terminal of Fospar S.A. Fertilizantes Fosfatados do Paraná (Fospar) in Paranagua, Brazil. In the port 300km to the south of São Paulo, the Model 4 crane in the G HSK 4316 B variant supports an identical crane which was delivered in 2012. They are both used together to handle fertilizer on the finger pier of the terminal, where they have replaced two obsolete cranes. G HSK 4316 B cranes, which currently handle 2.5 million tonnes of fertilizer a year, the company also sees itself as equipped for future growth, as Ronaldo Sapateiro, port manager at Mosaic explains:“The cranes unload seven to ten ships a month with an average of 30,000 tonnes of fertilizer on board and even open up further potential for us in view of constantly increasing handling rates.” Furthermore, he continues that due to their compact construction, comparatively low weight and individual portal solution, it is as if they are made for the finger pier. Terex® Gottwald portal harbour cranes are in demand worldwide for various terminal infrastructures, where they represent a cost- efficient alternative to bulk gantry cranes or continuous ship unloaders. 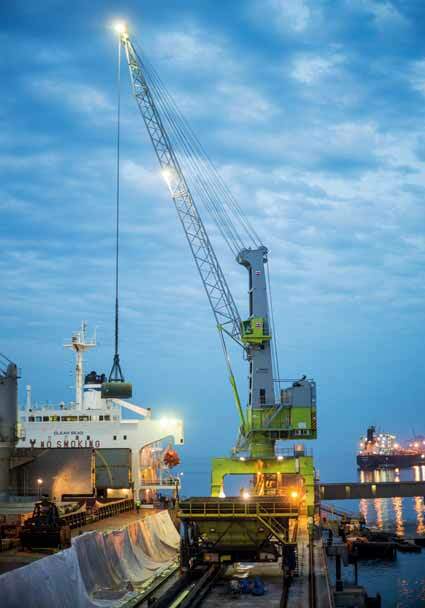 Portal harbour cranes offer proven Terex Gottwald mobile harbour crane technology and allow unimpeded operation of road trucks, trains and, in the case of Fospar, conveyor belts underneath the portals. They can also be adapted to the respective infrastructure conditions. TPS has supplied many portal harbour cranes to customers around the globe.The track gauge of these cranes is between 10m and 20m, depending on the environment, and the clearance between 4m and 8m.